Scan and organize your notes to remove the clutter of all those papers. Automatic text recognition (and searching) for typed information. Allows you to insert audio in a document, and if you take notes on that audio, it remembers where in the audio your note was taken so you can go back and listen to that particular location again. Notes can be synced online (for free) and edited there as well. There is an iPod/iPhone app for OneNote, but note that the free version allows up to 500 notes and then you can’t add any more notes. You can click and drag whole outline structure sub-trees from one place to another. EverNote is a popular mobile App. It’s a quick way to take notes and organize them, with search capabilities. Recent changes make you get an account, and I think you may have to have online access to use the free version. The Word and E-Sword allow you to create notes that are tied to Bible passages. You can even create your own commentaries. See the Bible Programs section for more details. 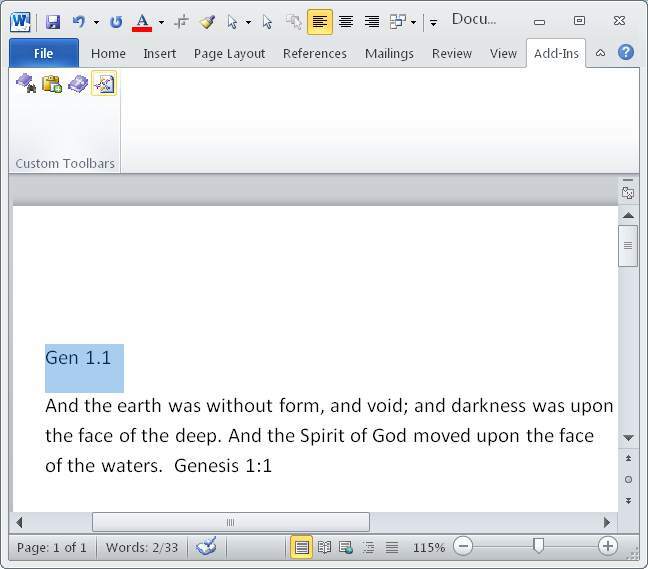 E-Sword has macros for Microsoft Word that enable auto-insertion of Bible texts. Select the reference, press the button, and there you have it. Pretty neat!